SIX IN 10 Irish people have had their chosen mode of transport damaged as a result of striking a pothole, according to research. Some 62.66% of 5,000 people surveyed said that damage had been caused to their car, motorbike or bike as a result of moving over an unrepaired pothole. In the case of motorists, tyre damage was the most likely fallout of a run-in with a poorly maintained road. Of those who had their car damaged by a pothole, 58.67% reported that one or more of their tyres had been punctured, with 41.40% stating that the wheel rim has also been damaged. Meanwhile, almost one in 5 people (18.11%) stated that their car’s suspension was damaged as a result of the incident. 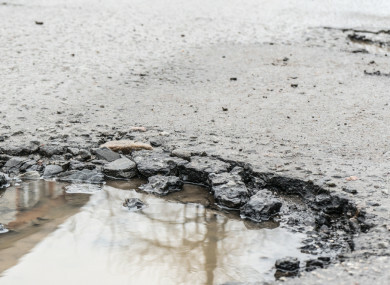 Conor Faughnan, Director of Consumer Affairs at AA Ireland, which carried out the survey, said potholes have “long been a significant annoyance for road users in Ireland”. He said the extreme weather conditions experience earlier this year had an impact in this regard. In the immediate aftermath of the snow and Storm Emma, we received a notable increase in breakdown callouts relating to potholes and while efforts to repair affected roads are ongoing, there is still a great deal of work to be done. Faughnan advised road users, particularly motorists, to “slow down when driving on a road which shows signs of being poorly maintained so as to minimise the damage if you do strike a pothole”. The vast majority of those surveyed had to cover the costs of the damage themselves, with less than 1% receiving any form of compensation. Just 0.63% of respondents stated that the costs of repairs were covered by the relevant local authority, while only 0.31% made a claim against their insurance to cover the costs. Email “Had your car or bike damaged by a pothole? You're not the only one ”. Feedback on “Had your car or bike damaged by a pothole? You're not the only one ”.